Being a traditional ingredient in the Indian cooking, green moong dal has proven health benefits. It is not only easy to digest and cooked quickly but also a good source of protein, high in fiber and low in fat. The glycemic index of green moong dal is 29 which comes under low GI category and glycemic load is 5.3 which is also low glycemic load range. Green moong dal contains lots of phytonutrients which proves to be anti-inflammatory and anti-microbial, helping to boost your immunity. 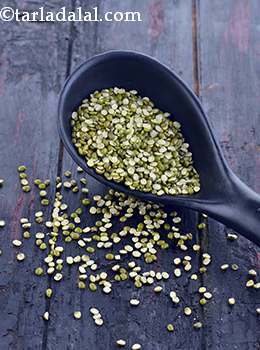 Is Green Moong Dal safe for Diabetics? The low glycemic index (29) of green moong dal proves to be beneficial for diabetics because 30 grams of green moong dal has 17.9 grams of carbohydrates which is complex. Thus the time required for absorption is higher and it remains in the blood stream for longer period of time. The anti-hypertensive effect of green moong dal is because of the high concentration of protein known as peptides. They tend to minimize LDL cholesterol oxidation which ultimately lowers inflammation. The amount of fiber in 30 grams of green moong dal is 2.4 which will not let the blood sugar levels fluctuate. Is Green Moong Dal suitable for Weight Loss? Since 30 grams of Green Moong Dal contains around 7.3 grams of protein, it is considered as one of the most filling food to have. Green moong dal has good amount of fiber which will further lead to satiety and perfect for weight loss. Thus regular intake of green moong dal will eventually reduce your overall food intake, boosting your weight loss. You can have this versatile dal as a curry, mix it with lots of vegetable and make a khichdi. You can also this dal with your cereals and make a thepla or a tikki out of it.